This release adds a global “Add a file” button to the main menu bar, which allows you to upload a file and register it as a knowledge fragment. Now that you can create both a text and file fragment anywhere via the main menu bar, I’ve deleted the old fragment editor from the home page. In this series of articles ‘The Piggydb Way’, I will try to explain why Piggydb is so unique and useful in terms of knowledge creation compared to other information management systems and how it will change the way you organize information. I will do my best by squeezing my limited English skills to convey the whole notion of what Piggydb is all about. Your feedback is always welcome. 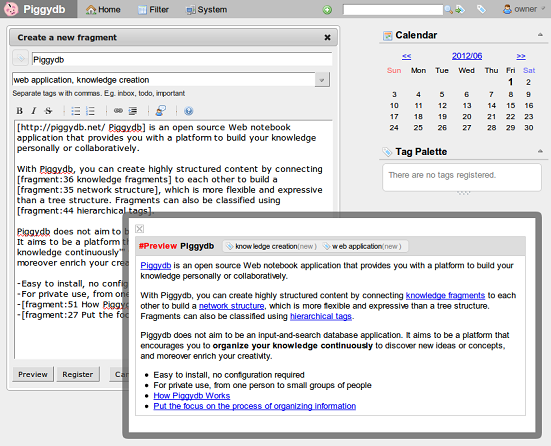 I guess many of you regard or use Piggydb as an organizable notebook. But why do you organize your information in the first place? In most cases, its purpose would be to make it easy to find a piece of information you need later on. There are countless applications and services that provide tools to do these things: folders, trees, tags, hyperlinks, etc. 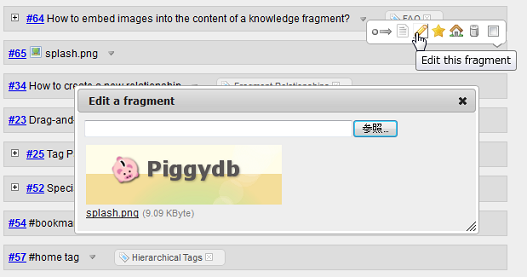 Compared to these applications, Piggydb has powerful tools: Fragment Relationships and Hierarchical Tags. But here in this series of articles, I’d like to explain that Piggydb aims not only to provide such tools for organizing information, but also to seek further value by providing a way to build your own ‘concept’ maps. The most important feature of Piggydb is ‘tags’. 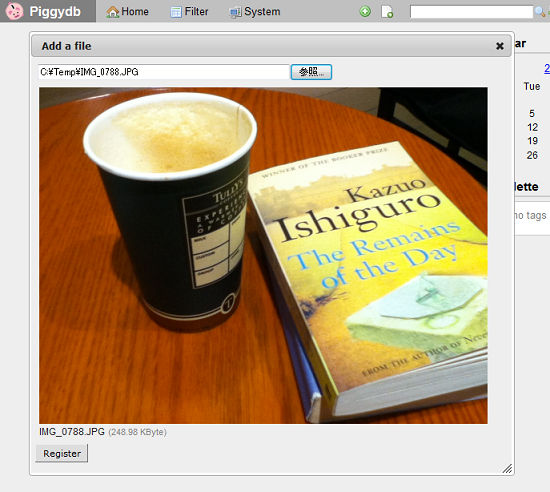 However, you may not need them if you use Piggydb as an organizable notebook. Actually when I used it in the recent work to manage the project related information, I did not use tags at all except the system tags (#home, #bookmark, etc). Just connecting fragments was sufficient to manage the information (multi-parenting perfectly worked to organize the complex information). 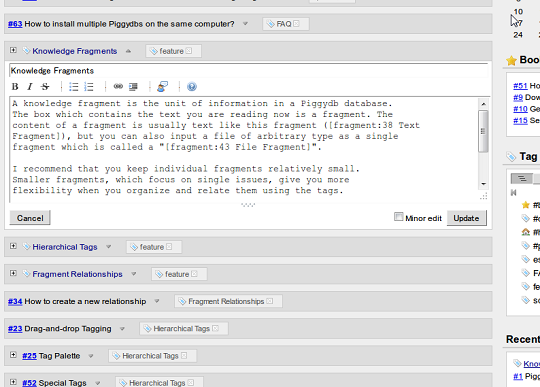 Heavy users may have realized that the roles of fragment relationships and tags are overlapped because both have similar functionalities in terms of ‘grouping’ fragments. So if you just need to organize information on your daily life or work, it would be sufficient to use only either of them. Well then, why am I saying tags are especially important in Piggydb? Tagging has become one of the primary ways people organize information since Web 2.0 services adopted it as their important features. Tagging was introduced as a more lightweight alternative to the existing classification systems such as hierarchies. Hierarchical classification systems manage categories by single-parenting tree structure and their vocabularies should be controlled carefully in order to work properly (controlled vocabulary). Although tagging was adopted as an effective alternative to hierarchies, there is a trade-off between these two systems. Tagging is certainly more flexible and easier to use in the way you can attach multiple labels you come up with to a piece of information while hierarchies force you to select a single category following the existing hierarchy. But what will happen when the amount and varieties of information increases? Japanese economist Yukio Noguchi argued in his best-selling book published in early 1990s that any attempt to classify information to make it searchable is useless in the first place. He pointed out the problems in classification. One of them is the ‘Bat Problem’ which arises when classifying information and goods. Material things and information can have multiple attributes that are used respectively depending on the context (e.g. Bats have the properties of both birds and beasts). He also referred to Wittgenstein’s ‘Family Resemblance‘ principle, which states that “things which may be thought to be connected by one essential common feature may in fact be connected by a series of overlapping similarities, where no one feature is common to all (from Wikipedia)”. This idea also shows the limits of the traditional taxonomy (known now as ‘monothetic’). Watanabe thought that any classification is arbitrary and inevitably biased by our cultural background. With these problems in mind, you should realize that hierarchical classification turns to be only a representation of a limited perspective and how fragile it is for ever-changing knowledge management. Even tagging, which is more flexible and solves some of the problems such as the Bat Problem, cannot escape from the problem of maintaining consistency. Rather, in tagging where users can freely choose words, classification can more easily lead to the lack of control than hierarchies, for example, the resulting vocabulary will be filled with homonyms (the same tags used with different meanings) and synonyms (multiple tags for the same concept). To begin with, tagging has been popularized in the context of Folksonomy, in which searchability or comprehensiveness is not the major purpose of classification, but it aims at promoting communication among users triggered by matching tags for finding more valuable information efficiently. I have explained how fruitless it would be to classify information for searchability so far, but it might not even need those stiff theories. You have probably experienced a situation where you had been organizing your classification with great effort, but you ended up not using most of it, and what you really needed was just a simple keyword search, haven’t you? Still, I would be certain that there are many people who insist that it works, at least, for them, and actually there are such cases, which I call ‘Stable Classification Schema Case‘. The demo site Table Tennis Videos is a good example for this. But I won’t discuss this case further because it is not directly related to Knowledge Creation I want to focus on here. So finally, after a long digression, I’m returning to the main point: why am I saying, in Piggydb, which does not have any features related to Folksonomy, the most important feature is tags? The theorem of the ugly duckling proved that any classification is arbitrary, and this arbitrariness makes it difficult to maintain the consistency of classification, therefore, classification is quite limited as a way to build an index for information. However, if we change our point of view a little bit, on the other side of arbitrariness, couldn’t it be said that classification is creative in terms of expressing one’s thoughts, ideas, or lessons? As you know from tag clouds, your tags represent the essence of your database or lessons learned in the course of growing your database. In a traditional way of information management, the essence comes before building the content of a database, like defining a classification hierarchy as a container of information. What will happen if you reverse this process? You don’t create tags as a mere index for information, but as a reflection of your growing database and make them the central part of your knowledge. I’m going to explain this reversal process more in depth in this series of articles, but before diving into it, in order to distinguish between these two tag usages, let’s call them respectively ‘Tag as Index‘, where tags are created for searchability, and ‘Tag as Concept‘, where tags are created to represent the important concepts learned in the growth of your database. This is a quick release to add minor improvements along with bug and style fixes (details). This release makes the new fragment editor, which was introduced in the previous version, available for updating fragments. Long time no see. Actually it’s been about a half year since I released the last version. During the long break, I carried on the development little by little (as you know if you follow me on Twitter) and finally released Piggydb V6.0-dev1 today. 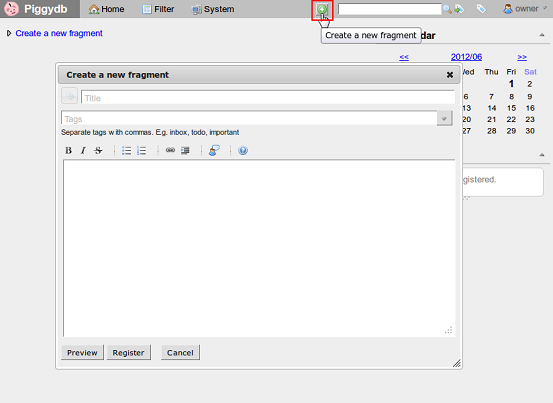 This new fragment editor is currently available only via the global “Create a new fragment” button in the menu bar. It’s going to replace all the old editors in the coming versions. The new dialog-style editor can be applied ubiquitously compared to the old embedded-style editor, and makes it easy to edit larger fragments. 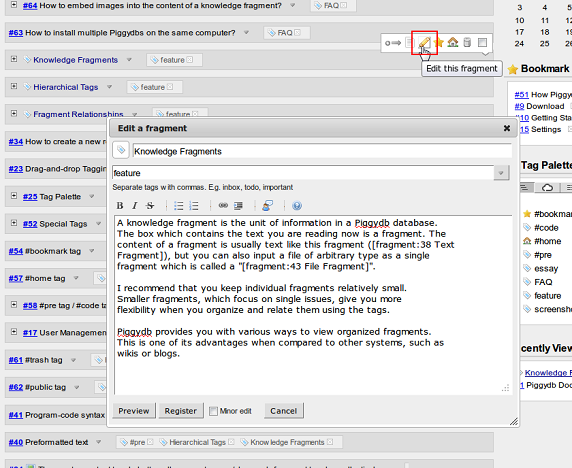 I thought before that keeping knowledge fragments small is a good practice in the context of knowledge creation and so the embedded-style editor would be enough for Piggydb. But now I’ve changed my mind. It would be better to wait to split information into small fragments until you need it, otherwise your database will be filled with junk that you end up never using. Anyway, I am relieved to release the new version (it seemed never-ending) and looking forward to your feedback.